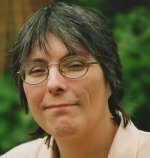 Continuing the section on embroidery history we move into the sixteenth century. Read part 1 here. The main change of style in the sixteenth century was from the ecclesiastical to the secular. 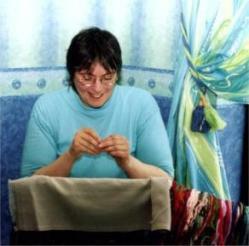 The effect of the Reformation was great, much embroidery was lost or mutilated, converted to other uses or taken abroad. The Elizabethan age was one of travel and adventure and brought new materials and designs. The ground was linen, silk or satin and sometimes velvet or leather. The embroidery was done in various coloured wools or silk (often outlined in gold or silver thread) and sometimes entirely in gold or silver. 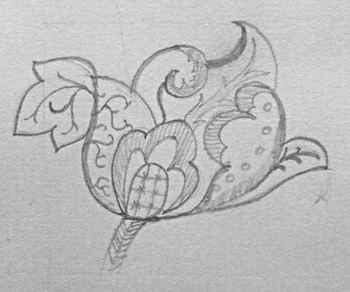 The designs were often some form of scroll work with freely drawn natural forms. Flowers, fruits, animals, birds and insects were used together and combined with quaint devices probably taken from woodcuts and books of the period. The favourite flowers/fruits of the period were the pansy, rose, carnation, strawberry and honey-suckle. 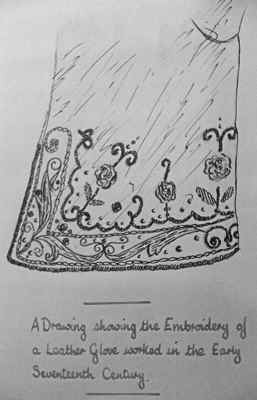 Another form of embroidery gaining popularity in England at this time in embroidery history was Spanish Blackwork. The name was given to any embroidery worked in black thread on white material and it is said to have been introduced into the country during the reign of Henry the eighth by Queen Catherine and her ladies. However, the technique is of great antiquity, being adopted by the Spaniards from the Moors and Arabs, who in turn borrowed it from the Egyptians and Persians. Gold thread was also used in this type of needlework, to produce a richer effect and the subjects of many famous portraits are depicted wearing shirts, bodices, caps, jerkins and even smocks of white fabric beautifully embroidered with black silk touched in with gold. Many of these portraits were painted by Hans Holbein after whom the double back stitch used for blackwork has been named. Other stitches used included chain, buttonhole, braid and coral stitches. The designs of this period favoured floral designs with long waving stems, leaves, flowers and vines worked in minute and delicate stitchery. 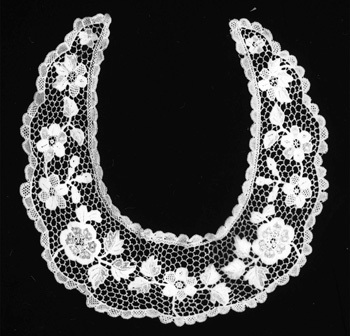 Throughout embroidery history, many techniques decline in popularity at certain periods and this was the case with blackwork during the 17th century, although it is now popular again. The charm of the Elizabethan patterns gave way in this era to designs that were exaggerated and grotesque. Standards of taste and workmanship were poor and the designs showed less originality. A technique popular at the time was stumpwork which consisted of figures and scenes modeled in relief by stuffing with wool or hair so that what should have been characteristic work of the needle became an imitation of sculpture. However, often used in conjunction with this were delightful little trees, birds and animals (some of these are said to have been of symbolic meaning referring to the House of Stuart). There were sometimes landscapes depicted complete with castles, palaces, fountains, gardens, clouds and radiating suns. Beads, glass, mica, wooden shapes, leather and sequins, along with gold thread, were often used as well as the more usual threads. In this period of embroidery history, once again the designs and methods change. The general scale has increased and large panels and hangings were characteristic of the late 17th century. The ground was generally linen with huge sprays of flowers or many-branched trees rising from mounds of earth among which animals play. The stitchery was usually in wools, using browns, greens, orange and peacock blue which were favourite colours of the time. Sometimes a piece of work was embroidered in tones of one colour. The general type of work done during the 17th Century was still used in the 18th, but as time went on embroidery became much more naturalistic in character until eventually the imitation was such that the essential qualities of the needlework resembled brush work. The great variety of natural objects...flowers, trees, birds, animals and insects... were often worked on the same piece of cloth. The growth of trade with China and the far East brought an influence in design and birds with wonderful plumage and flowers resembling the lotus and chrysanthemum were introduced alongside the traditional English forms. Household items such as hangings and coverlets were embroidered in much the same way as in the previous century of embroidery history, however, there was a change from worsteds to silks and in addition, there was a great interest in embroidery in relation to furniture. 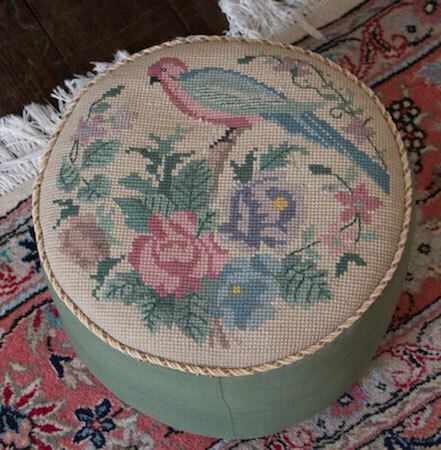 Chair and stool covers were worked in cross stitch, and needlepoint stitches known as petit point and gros point. Both men's and women's costumes were decorated with sprigs and borders, finely embroidered flowers and leaves, often with the addition of metal threads. These were usually worked in satin stitch or long and short stitch. While embroidery was still largely practiced, this period on the whole was one of revival rather than originality. As an art much of the work deteriorated. This may have been due to the introduction of machinery and mass reproduction. The field of women's interests became much wider and with increased activities outside the home there was less time for domestic crafts. Costume was much less elaborate and embroidery was usually replaced by machine made braids and motifs. The vogue for the sampler was very apparent in the first half of the century and there followed a fashion for woolwork pictures. Although samplers of stitches and methods had been made for many years it was in the 18th and 19th Century that they became one of the chief occupations of the embroiderer. They often had some pictorial value, of a very formal type, which had in addition in the 19th century, a quotation which might be a motto, words from the Bible or often a rhyme of gloomy sentiment. These samplers were often done in wool cross stitch on canvas and the general design included the name and age of the worker, the date, the alphabet, a quotation, formal motifs and a border.